The staff of CYC-fellowship House pose with the official shake & stir check. The third annual Shake & Stir, presented by the CYC Auxiliary Board and Epsilon Economics, was a success! T-up nation, a dance group comprised of teens from cyc-elliott donnelley youth center in bronzeville, performs at shake & stir. Through the generosity of our sponsors and attendees, we raised more than $113,000 net for CYC-Fellowship House in Bridgeport. Your support equips CYC to equalize access to resources that will help our youth develop the skills needed to succeed in the 21st century. Members of the CYC-Auxiliary Board pose in the photo booth at Shake & stir. 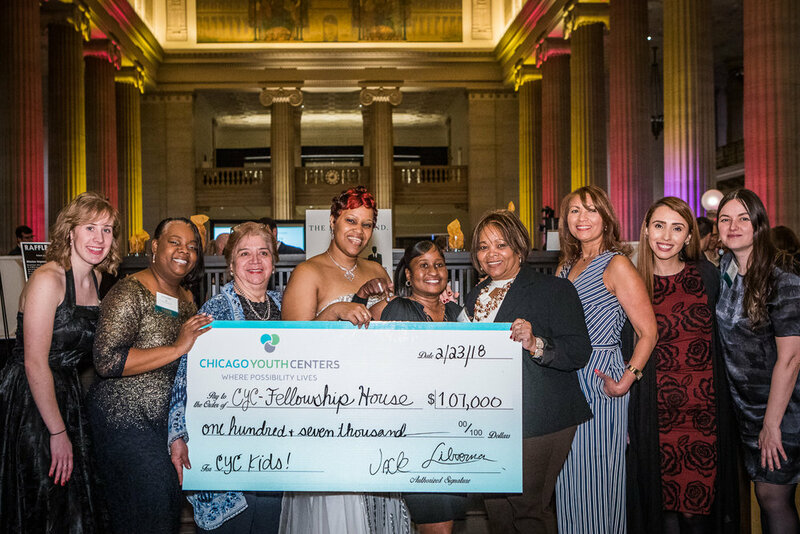 The event, which was attended by more than 500 people, featured live entertainment from top Chicago band Maggie Speaks and dance group Lady Jack Entertainment. Shake & Stir also featured some homegrown entertainment: T-Up Nation, a group of teen dancers who attend CYC-Elliott Donnelley Youth Center in Bronzeville. Guests also enjoyed exciting bites like mini crab cakes from Polo Inn Café, sliders and macaroni cheese from New Line Tavern, lobster ravioli from My Private Chef and more. Generous beverage donations from Tito’s Vodka, Mendocino Wine Co., Koval Distillery, and Stoller Imports were also appreciated by attendees. Thank you so much to all of our generous sponsors! You’re truly #StirringUpChange in Bridgeport. To view more photos from the event, click here. To view photo booth pictures, click here.